Does bringing a sick pal soup sound like your cup of tea? Are you the type to always offer to help a friend move? Do you step up to throw your bestie a baby show, even though you're probably too busy? If you're someone who just loves helping out friends in need, then you may want to consider a new profession. We hear there's a vacancy in the fairy godmother department, and you sound like a perfect candidate for the gig! 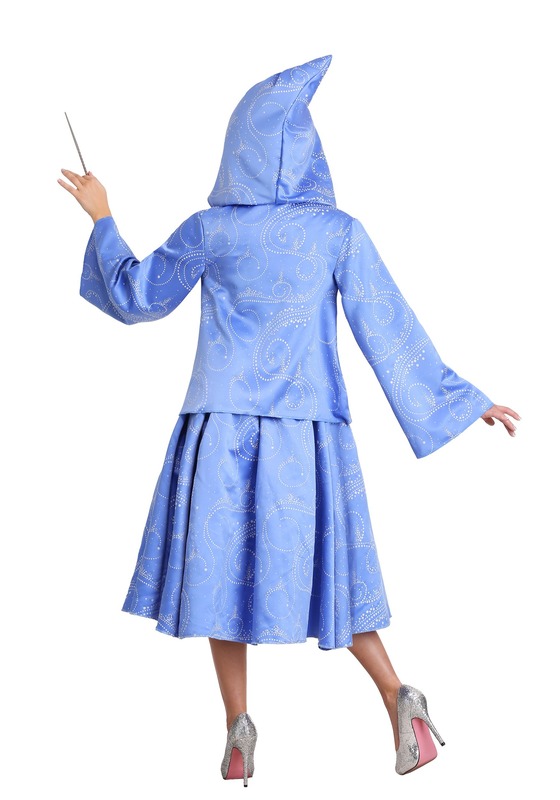 But to land such a prestigious title (not to mention a magic wand), you'll need to look the part, first. 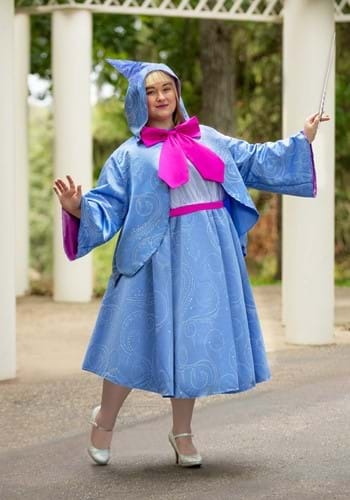 This Plus Size Fairy Godmother Costume will ensure your second interview and castle visit go according to plan, and that you get a new nameplate to place on your desk (along with a surprisingly generous benefits package!). Not to mention, think of how many folks in need you can help now that you're wearing this outfit? Everyone will know you're their go-to gal for emergency fixes and fabulous, last-minute makeovers! This licensed look is taken straight from the pages of Cinderella and is the official garb of the Magical Fairy Godmother Guild (MFGG). This elite society is made up of highly-skilled helpers who can make your wildest dreams come true. So, are you ready to join? It won't be easy, but once you're trained, you get to wear this amazing costume! It's a beautiful blue sleeveless dress with an attached petticoat and a pretty printed pattern. The short, hooded jacket matches the dress design, and the brilliant pink bow complements your appearance. Get ready to wave that wand, lady, because you look simply magical! The best part of this look for a do-gooder like you is, well, all the good you'll get to do once you're officially instated. Try to remember to wave that wand over yourself, every now and then. Even fairy godmothers need a little self-care sometimes!